The remarkable Tyler Hicks seems to have a knack for being present where things happen. Hicks, the NYTimes photojournalist who won a Pulitzer Prize for breaking news this year for his 2013 photos of a mass shooting at a mall in Kenya, just happened to be nearby Wednesday when news broke again. 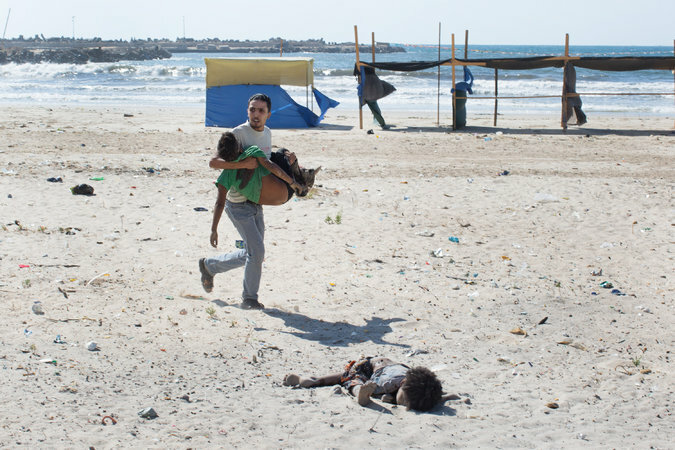 He was staying at a seaside hotel in Gaza when an Israeli rocket struck the beach, killing four young cousins. I had returned to my small seaside hotel around 4 p.m. to file photos to New York when I heard a loud explosion. My driver and I rushed to the window to see what had happened. A small shack atop a sea wall at the fishing port had been struck by an Israeli bomb or missile and was burning. A young boy emerged from the smoke, running toward the adjacent beach. I grabbed my cameras and was putting on body armor and a helmet when, about 30 seconds after the first blast, there was another. The boy I had seen running was now dead, lying motionless in the sand, along with three other boys who had been playing there. By the time I reached the beach, I was winded from running with my heavy armor. I paused; it was too risky to go onto the exposed sand. Imagine what my silhouette, captured by an Israeli drone, might look like as a grainy image on a laptop somewhere in Israel: wearing body armor and a helmet, carrying cameras that could be mistaken for weapons. If children are being killed, what is there to protect me, or anyone else? I watched as a group of people ran to the children’s aid. I joined them, running with the feeling that I would find safety in numbers, though I understood that feeling could be deceptive: Crowds can make things worse. We arrived at the scene to find lifeless, mangled bodies. The boys were beyond help. They had been killed instantly, and the people who had rushed to them were shocked and distraught.